There’s something special about the final film in a “prequel trilogy” that almost defies explanation. It acts as a springboard to the original content while also tying up all the loose ends that presented themselves in the previous installments of the trilogy. Since the source material is well-known, a viewer can deduce how it will end, but not necessarily how it will get there. In this sense, movies like Star Wars: Episode III – Revenge of the Sith (2005) and War for the Planet of the Apes (2017) share a common theme as links between the new and the old. 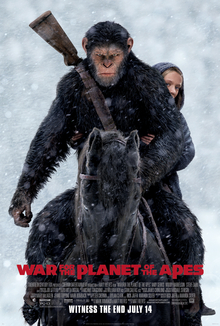 Similar in tone to Dawn of the Planet of the Apes (2014), War continues the escalating conflict between the titular apes and the now-endangered humans. Unfortunately, because it places Caesar (Andy Serkis) as the primary protagonist of the whole trilogy, the “savior” parallels are a little too heavy-handed here. Heck, they should have titled it Passion of the Planet of the Apes. Still, holding true to the original Planet of the Apes (1968), War almost felt like an homage to another 1960’s classic as well: The Great Escape (1963). Of course, while I enjoyed this prequel trilogy and reveled in its impressive computer-generated imagery, it does produce a particular divergence from the original franchise. I haven’t seen them in a while, but I’m not sure these rebooted films hold up to the plot continuity of the original “prequel trilogy” that was Escape (1972), Conquest (1972), and Battle (1973). Either way, War stands as an excellent end to a reboot series, replete with immediate and long-term foreshadowing that leads people to go back and watch the original Planet of the Apes. A fitting end to a pretty good prequel trilogy, I give War for the Planet of the Apes 4.0 stars out of 5.